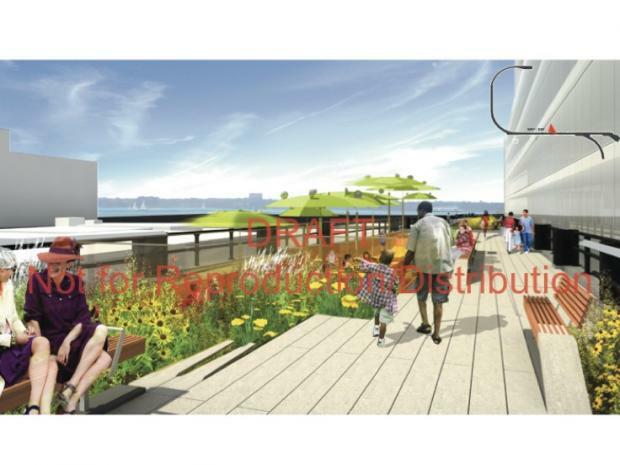 CHELSEA — A train car-turned-food-shop, a beam-and-girder playground, and many more plants are all in store for the High Line's upcoming third section, according to documents obtained by DNAinfo.com New York. The new plans for the High Line's final section show significant changes since renderings were originally presented in March, with more plants, a clearer path for visitors to walk on, and a unique new play area for kids. Friends of the High Line presented the plans for the $90 million project as a draft to Community Board 4's Waterfronts and Parks Committee. They were meant to be released on Aug. 6. The park's history of innovative design is on full display in the renderings, which show off a variety of new flourishes not seen in the park's first two sections. The final segment of the park travels west from West 30th Street and 10th Avenue, then loops up 12th Avenue around the West Side Rail Yards to West 34th Street. Designers plan to put an actual boxcar at the very end of the High Line on West 34th Street that will open up to host a food vendor, currently called "Cold Train." Visitors will be able to enjoy their food in a new picnic area, complete with bright green umbrellas that spin in the wind. The park's unique take on playgrounds include a "beam exploration area" west of 11th Avenue that, by coating them in rubber, turns the beams of the original High Line structure into a play area that kids can twist, turn and play hide-and-seek in. A large, plant-filled section east of 11th Avenue is tentatively called the "Grasslands." Hanging vines also dangle off the sides of the elevated park in the new plans. An interim walkway traveling up 12th Avenue has been enlarged since previous plans, creating more space to walk and more places to sit while maintaining aspects of the "wild" plants already on the elevated track. CSX Transportation, the owner of the defunct stretch of railroad slated to become the final section of the High Line officially handed over the elevated structure to the city on Tuesday, clearing the way for construction of the park's much-anticipated third segment. Construction on the project is expected to begin later this year.